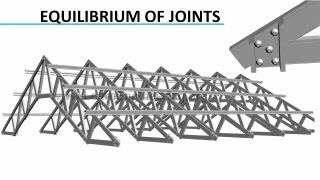 Truss analysis using Method of joints is elaborated in this video lecture with help of detailed animation. Here step by step procedure of analyzing a truss is elaborated. That is making free body diagram of truss, determination of reaction forces and applying concept of equilibrium of joints to each joint of truss to determine unknown forces in truss members.